Call Ahead for Private Events! 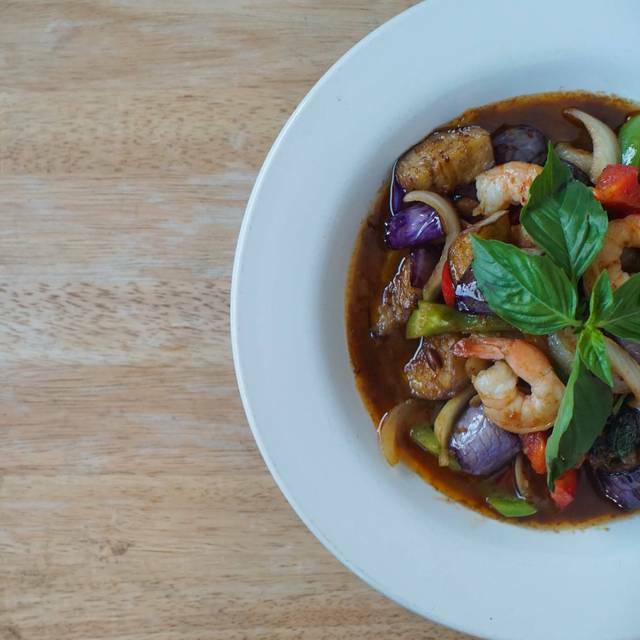 Chao Praya is more than just a Thai Restaurant, it’s an expression of fresh ingredients combined with over 30 years of authentic cooking experience to bring the taste of Thailand to Eugene. Fried wonton stuffed with cream cheese, imitation crab, bell peppers, onions, celery, water chestnuts, served with sweet and sour sauce. Deep fried tofu served with sweet and sour sauce and ground peanuts. Deep fried wonton stuffed with ground chicken served with sweet and sour sauce. Deep fried mixed vegetables and silver noodles rolled up and fried crispy served with sweet and sour sauce. Fresh raw vegetables and rice noodles wrapped in soft rice paper served with sweet & sour sauce and ground peanuts. Grilled chicken breast on skewers, marinated in Thai special sauce mixed with coconut milk. Served with peanut sauce and cucumber salad. Your choice of deep fried battered shrimp, squid, or mixed vegetables served with plum sauce. Samplers of appetizers - fried tofu, fried wonton, crispy salad roll, chicken satay. Samplers of appetizers - fried tofu, crispy salad roll, fresh salad roll, golden pumpkin. Wrap it yourself, lettuce, coconut flakes, ginger, dried shrimp, lime, onion, peanuts, and chili served with Thai sweet herb sauce. Deep fried Asian pumpkin served with homemade sauce. Deep fried shrimp wonton served with plum sauce. Deep fried sweet and spicy chicken wings marinated in homemade Thai style chili sauce. Deep fried coconut shrimp served with sweet & sour sauce. Tilapia golden brown and crispy in sweet and spicy homemade sauce. Fried tilapia fish cake in a red curry sauce with green beans, kaffir leaves, and crispy, fried basil leaves. Mixed vegetables, hard-boiled egg, and tofu served with peanut sauce dressing. Shredded raw papaya with peanuts, palm sugar, tomatoes, green beans, carrots, chilies, and lime juice. Shredded raw papaya with shrimp, peanuts, tomatoes, green beans, carrots, chilies, and lime juice. Sliced grilled sirloin mixed with spices, lime juice, lettuce, onions, tomatoes, and cucumber slices. Choice of ground chicken, beef or pork, mixed with lime juice, onions, rice powder, and cilantro. Grilled marinated chicken breast, spicy lime dressing, chilies, tomatoes, cucumbers, onions, and romaine lettuce topped with cilantro. Cooked shrimp with spicy lime dressing, romaine lettuce, onions, tomatoes, and cucumber. Cooked squid with spicy lime dressing, romaine lettuce, onions, tomatoes, and cucumber. Cooked shrimp, squid, scallops, and mussels with spicy lime dressing, romaine lettuce, onions, tomatoes, and cucumber. Choice of ground chicken or pork, tossed with shrimp, vermicelli noodles, spicy lime dressing, onions, peanuts, and tomatoes served on a bed of lettuce and topped with cilantro. Fried catfish served with shredded papaya, peanuts, tomatoes, green beans, carrots, chilies, lime juice and sticky rice. Your choice of prawns of fish in curry sauce mixed with kaffir lime leaves, basil, bell peppers, cabbage, carrots, and peas. Deep fried slices of catfish stir-fried in chili sauce with bell peppers, onions, and topped with crispy basil. Deep fried trout topped with sweet and sour sauce mixed with pineapple, bell peppers, onions, tomatoes, cucumber, carrot, and basil. Deep fried trout topped with ginger, mushrooms, onions, celery, carrot, and ground chicken. Thai BBQ chicken marinated in homemade sauce with special shrimp fried rice. Thai BBQ pork ribs marinated in homemade sauce with special shrimp fried rice. Seafood (shrimp, scallops, squid, mussels) stir-fried with cabbage, broccoli, onions, bell peppers, mushrooms, baby corn, and basil. Grilled chicken breast marinated in Thai herb sauce, topped with organic peanut sauce, and served with steamed vegetables. 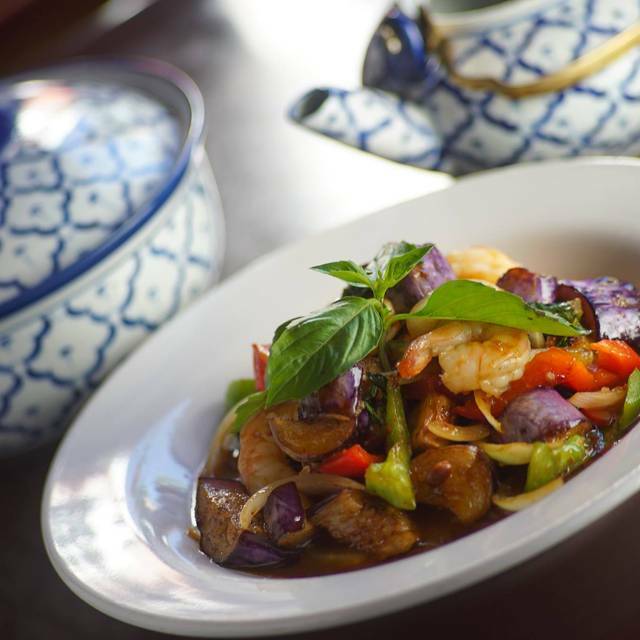 Shrimp or ground chicken or ground pork stir-fried in special Thai chili sauce with bell peppers, onions, and topped with crispy basil. Deep fried breaded pork short ribs, topped with pineapple, tomatoes, cucumber, carrots, and onions in sweet and sour sauce. Crispy squid battered with salt and pepper, topped with house special chili sauce, bell peppers, and onions. Pork short ribs broiled until tender and carefully fried until golden and crispy, topped with stir-fried chili jam, onions, and bell peppers. Choice of tofu, meat, or seafood, with medium size rice noodles, egg, chili sauce, water chestnuts, cashews, onions, and bell peppers. Choice of soft or crispy tofu, stir fried with broccoli, bamboo shoots, onions, and bell peppers, topped with Thai chili sauce. Fried crab, garlic, and cilantro over stir-fried bell peppers, carrots, green beans, and onions. Choice of tofu, meat, or seafood, with stir-fried Asian Pumpkin, egg, green beans, and basil in the choice of Regular or Spicy Chao Pra Ya special sauce. Panang curry with salmon, carrots, peas, bell peppers, basil, and steamed cabbage. Crispy chicken with Thai chili sauce, green beans, and kaffir lime leaves. 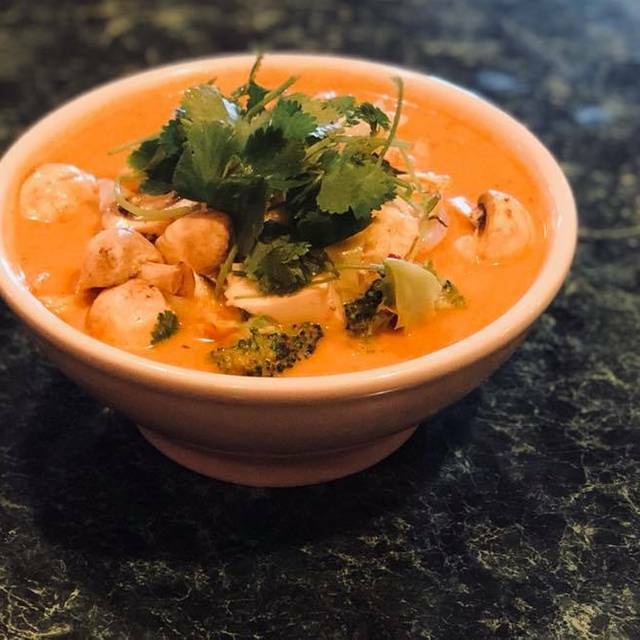 Very spicy red curry, stir-fried with your choice of ground chicken or duck, served with romaine lettuce and jasmine rice. Choice of tofu, meat, or seafood with red curry, bamboo shoots, eggplant, bell peppers, and basil. Choice of tofu, meat, or seafood with green curry, bamboo shoots, eggplant, bell peppers, green beans and basil. Choice of tofu, meat, or seafood with yellow curry, potatoes, bell peppers, carrots, and onions. Choice of tofu, meat, or seafood with massaman curry, potatoes, carrots, onions, and peanuts. Choice of tofu, meat, or seafood with pa nang curry, green beans, and kaffir lime leaves. Choice of tofu, meat, or seafood with classic style red curry sauce mixed with cabbage, carrots, broccoli, mushrooms, green beans, and peas. Roasted duck with red curry, pineapple chunks, bell peppers, tomatoes, and basil. Red curry with shrimp, pineapple chunks, bell peppers, tomatoes, and basil. Choice of tofu, meat, or seafood in massaman curry with avocado, potatoes, carrots, onions, and peanuts. Sliced catfish stir-fried in red curry, with coconut milk, green beans, bell peppers, krachai strips, and basil. Choice of tofu, meat, or seafood with fresh mango in red curry sauce with bell peppers and basil. Spicy & sour soup made from lemon grass, galangal root, kaffir lime leaves, lime juice, mushrooms, cabbage, and onions, topped with cilantro. Coconut soup made from coconut milk, lemongrass, galangal root, kaffir lime leaves, lime juice, mushrooms, cabbage, and onions topped with cilantro. Beef stew with potato, carrots, celery, and onions, topped with cilantro. Spicy and sour seafood soup with fish, shrimp, scallops, mussels, squid, lemongrass, galangal root, kaffir lime leaves, lime juice, cabbage, mushrooms, and onions, topped with cilantro. Choice of tofu, meat, or seafood in our clear tasty broth with soft tofu, vermicelli noodles, celery, broccoli, mushrooms, and green onions. Choice of tofu, meat, or seafood, stir-fried with medium rice noodles, egg, onions, bean sprouts, and topped with ground peanuts. Choice of tofu, meat, or seafood, with wide rice noodles, egg, broccoli, and topped with cilantro. Choice of tofu, meat, or seafood, stir-fried with wide rice noodles, chilies, egg, broccoli, bamboo shoots, bell peppers, bean sprouts, and basil. Choice of tofu, meat, or seafood, with wide rice noodles, broccoli, carrots, baby corn, and mushrooms, in gravy sauce. Choice of tofu, meat, or seafood, with crispy egg noodles, broccoli, carrots, baby corn, and mushrooms, in gravy sauce. Choice of tofu, meat, or seafood, with vermicelli noodles, egg, baby corn, broccoli, carrots, mushrooms, onions, and green onions. Wide rice noodles with chicken, egg, lettuce, green onions, topped with cilantro. Choice of tofu, meat, or seafood, in clear broth with medium rice noodles, bean sprouts, and green onions. Stewed beef soup with rice noodles, celery, bean sprouts, and green onions. Choice of tofu, meat, or seafood, with medium rice noodles in red curry sauce, with steamed cabbage, carrots, mushrooms, broccoli, and basil. Choice of tofu, meat, or seafood, stir-fried with egg noodles, onions, baby corn, celery, mushrooms, carrots, broccoli, bean sprouts, and green onions. Steamed rice noodles in green curry sauce, topped with shrimp, pumpkin, eggplant, bell peppers, bamboo shoots, green beans, and basil. Spicy and sour soup with rice noodles, a combination of chicken and shrimp, and bean sprouts, topped with ground peanuts. Hot and sour pork broth with sliced pork or chicken breast, fine rice noodle, onion, celery, bean sprouts. Choice of tofu, meat, or seafood, with Northern Thai curry sauce over steamed egg noodle, ginger, red onion, and basil, topped with crispy egg noodles and tofu pieces. Thai BBQ chicken marinated in our homemade sauce served with tomato and cucumber slices. BBQ pork spare ribs marinated in our own sauce served with tomato and cucumber slices. Sirloin steak marinated in homemade sauce, grilled and served with a Thai sweet and spicy chili sauce. Grilled chicken with steamed broccoli, cabbage, carrots, topped with teriyaki sauce. Grilled marinated rib eye steak, served with steamed broccoli, carrots, onions, steamed rice, and teriyaki sauce. Marinated pork skewers served with peanut sauce, sticky rice, and a small green salad. Choice of tofu, meat, or seafood with chili paste, bell peppers, onions, carrots, and basil. Choice of tofu, meat, or seafood with chili paste, bell peppers, onions, carrots, eggplant, bamboo, and basil. Choice of tofu, meat, or seafood with chili paste, bell peppers, onions, carrots, water chestnuts, and basil. Choice of tofu, meat, or seafood with chili paste, green beans, kaffir lime leaves, and ground peanuts. Choice of tofu, meat, or seafood with chilies, bell peppers, onions, carrots, mushrooms, and shredded ginger. Choice of tofu, meat, or seafood with baby com, bell peppers, broccoli, cabbage, carrots, mushroom, onions, and green onions. Choice of tofu, meat, or seafood with sweet and sour sauce, onions, bell peppers, carrots, cucumbers, tomatoes, pineapple chunks, onions, and green onions. Choice of tofu, meat, or seafood with steamed broccoli, cabbage, carrots, mushrooms, topped with organic peanut sauce. Choice of tofu, meat, or seafood with bean sprouts, broccoli, baby corn, carrots, mushrooms, onions, and green onions. Pork ribs stir-fried with special homemade garlic sauce, served with steamed broccoli, carrot, and cabbage. Choice of tofu, meat, or seafood with garlic, black pepper, broccoli, carrots, cabbage, mushrooms, and topped with cilantro. Choice of tofu, meat, or seafood with fresh mango, sweet red chili paste, carrots, onion, bell pepper, and topped with cilantro. Thai fried rice with choice of tofu, meat, or seafood, with egg, broccoli, onions, tomatoes, peas, and carrots, served with tomato and cucumber. Thai spicy fried rice with a choice of tofu, meat, or seafood, with chilies, egg, bell peppers, onions, basil leaves, served with tomato and cucumber. Fried rice with crab, egg, onions, peas, carrots, tomatoes, and topped with fresh cilantro. Fried rice with shrimp, egg, onions, peas, carrots, raisins, tomatoes, pineapple chunks, cashew nuts, and topped with fresh cilantro. Tapioca pearls in milk with crushed ice and your choice of flavor: Coconut, Mango, Melon, Thai Tea, Thai Coffee, Green Tea, Lychee, Strawberry, Banana, Watermelon, Blueberry, Cherry, Taro. The food was very good but a bit spendy. I have eaten at two other places that are just as good and less money. If you are staying in the downtown area it is in walking distance and not a bad choice. Food is good. Dish with green beans was very spicy. One dish was incorrect. The food was not bad, not great either. Brought me the wrong protein in my soup I ordered. But I don’t like to complain so ate it anyway. It wasn’t very busy at the time so that is why I only left 15%. But after saying that I don’t think it was the food so much but lack of knowledge on the best thing to order when at a tai restaurant. Like usual for me though spicy was not actually spicy. Each restaurant is different in there rendition of there own spicy so hard to judge pre meal going just from menu statements. Cocktails available would be a nice addition. The table and room you gave us was perfect. The server was great. We could hear each other speak. My food was perfect. We made our reservation for 5:45 as we had a 7:00 show. At other restaurants that would have been ample time. But the service was very slow and our check hadn't come by 6:50 so we had to leave and just pay at the counter. The food was good however and had we not been in a rush to get to our show at the Hult it would have been a nice experience. I would recommend it for the great, freshly prepared food. It would also be great for a dinner where you want a relaxed dinner that provides plenty of time to chat and enjoy the food. Good Thai food, but be careful. Mild is actually hot. The ingredients are very fresh. The chicken satay was excellent. Read the menu carefully. It’s fun to mix ingredients and add a protein. Our server was outstanding! She went over and above to make sure we were happy, she's a gem! We saw the king of Thailand there. Excellent food at a reasonable price, would definitely visit this reastaurant again.